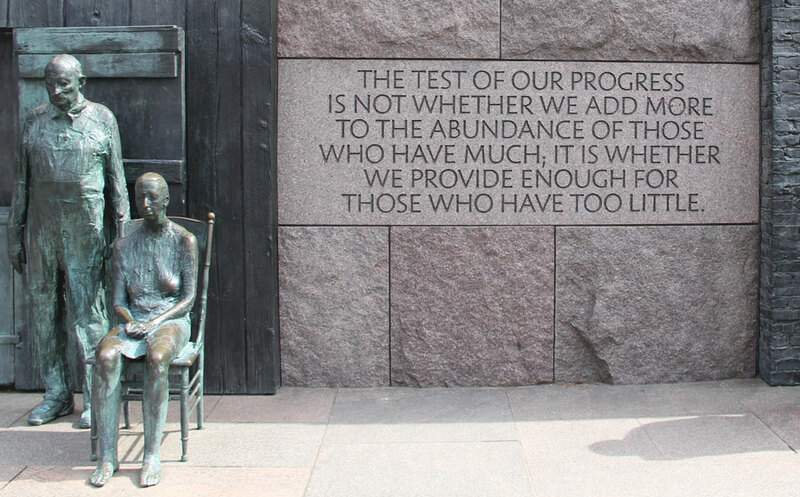 The Franklin D. Roosevelt Memorial in Washington, D.C., includes telling quotes from his momentous twelve years in office. I used to be this fiction person. Never willingly read anything else. But something’s come over me in the last year or so. Call it reality, at long last rearing its hydra heads, or maybe it’s just the anesthetic of youth finally wearing off, but whatever it is, I find myself increasingly drawn to long, detail rich, laboriously researched and exhaustively annotated books about history. I’m not sure where this is coming from, though I suspect it may be rooted in the sense of vertigo that came upon me after losing both my parents. Suddenly there’s no one holding down the floor anymore. It’s up to me to know what came before. And before that. And boy there’s a lot. While I’ve more or less abandoned hope of ever fully grasping the ups and downs of the Byzantine Empire or the Balkans, and European history is so full of incident and horror that I doubt I have the intellectual stamina to get far in that field, I feel the least I can do is try to get a grip on the story here in North America. You might have thought that, as product of Virginia public schools, I would have picked up a bit on my way through. But back then I was unable to really care about what happened before I was born. I mean, you know, life begins when you’re born, right? However, I just finished reading “No Ordinary Time,” Doris Kearns Goodwin’s 1995 Pulitzer Prize winning account of how the extraordinary partnership between Franklin D. and Eleanor Roosevelt changed the United States during World War Two, and I’m beginning to realize that I owe a lot to Eleanor. Also probably FDR. But honestly, as I worked my way through more than 600 pages filled with incident and amazing detail, it was Eleanor’s courage, determination, and vision that inspired me most. Her influence on civil rights, labor, and social justice for all helped change the nation. She took a lot of heat for being an uppity woman back before people had learned to appreciate the wonders an uppity woman can perform. She paved the way for generations of crusaders. The 1940s were indeed “No Ordinary Time.” Yet perhaps no time is ordinary. We live in an age of such breathtaking miracles and heartbreaking terror, sometimes it makes me want to curl up on the couch and take a nap. But then I think, what would Eleanor do? She was no napper. I’m trying to measure up. 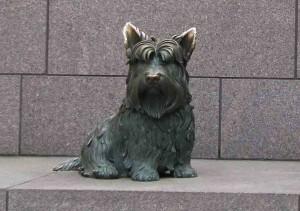 No ordinary dog, FDR’s beloved Fala has a place of honor at the memorial.